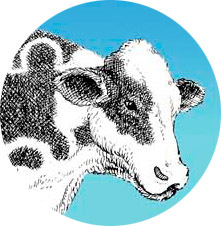 Welcome to the second annual Run The Farm 5 mile Trail Race on October 23, 2011! Race director Tony Godino, working closely with Judy Godino and Rob Cummings, has been busy over the last few months readying the course, gathering and organizing volunteers, designing the t-shirt, getting a handle on the logistics, and spreading the word about this fun, competitive, and family friendly trail race. Below are some important instructions regarding the race. The Muscoot Farm park staff, Westchester County police, and our volunteers will all be working to make it a great day and leave lasting memories for each of you. We are especially excited about the kids race and have over 250 kids registered for Kids Run The Farm! Check the KIDS RACE LOGISTICS email sent to parents with kids running. Reading it will help you on race morning! 1) ARRIVE EARLY Please plan to arrive at the park at least 30 minutes before your race (kids race is 8:30am, 5 miler is 9:15am). Car pool if you can. The main parking is on the east side of Route 100 across from the main park. It is in a grass field and there will be Westchester County Police Officers directing the traffic and making sure pedestrian traffic is safe when crossing the busy Route 100. DO NOT PARK BETWEEN THE ORANGE CONES ON EITHER SIDE OF THE ROAD. If the field parking fills up you will be allowed to park on the wide shoulder of Route 100 beyond the cones. 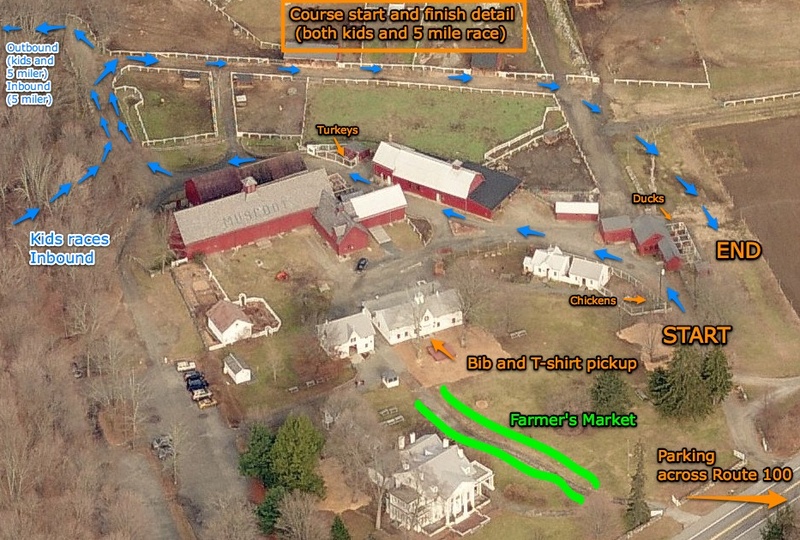 Bib pickup will be inside the white barn near the antique red tractor. 2) DRIVE SLOWLY and CAREFULLY in on Route 100 and in the Lot! Watch the volunteers who are directing the parking. PARK TIGHT! Plan ahead — carpool & consolidate 2 cars into one if you can. 3) LISTEN TO PRE-RACE ANNOUNCEMENTS Race Director Tony Godino will have important information about the course and safety. We will be delivering last minute course instructions before the races so please be as quiet as possible during the short pre race announcements. Danny Martin will recite a brief poem to set the tone before the 5 mile run. 5) IF YOU NEED TO STOP OR SLOW DOWN ON THE COURSE, pull off to your right side! Especially at the beginning of the race which will be crowded. The start of the course has 0.5 mile of dirt farm roads then 0.2 mile of meadow so there should be plenty of room to pass or slow down to reach your preferred pace. After then it is mostly single track trails with a few meadows. There is a big hill at around the 3 mile spot – if you have to slow down or walk up the hill, stay to the right. Collage of Run The Farm 2010. Photos contributed from lots of photographers (see photo page). 6) STAY ON COURSE IF YOU CAN’T CONTINUE There will be “sweeps” running the course following the slower runners. Wait for the sweep runner to get to you to assess your needs. If necessary, aid can come to you on the trail. 7) RESULTS: Printed lists of finishers with time and place will be available soon after the finish at the bib pickup area and shortly after that on the website. Check it out at http://runthefarm.org/results. We will announce the winners of the both the kids and the 5 mile race after the 5 mile race is completed. 8) THANK A VOLUNTEER A tremendous amount of volunteer effort has gone into creating this new event. If you see a volunteer please say hello. This event would not be possible without their help. We also would like to thank the Somers Volunteer Fire Department for having their dedicated EMS crew standing by in case they are needed. We are also grateful for the wonderful cooperation from Sue Moga and the Muscoot Farm staff and the County of Westchester Parks, Recreation and Conservation Dept. 9) SPEND YOUR FARM BUCKS Every finisher of the 5 Mile race will be handed one $5 “Farm Bucks” bill. (The kids races will also get $2 in Farm Bucks.) These Farm Bucks can be used like real dollars (on race day) at the Muscoot Farmers Market right near the finish area of the race. Our intent is to encourage runners to check out the market. We will reimburse the Farmers with real money at the end of the market. Remember, leave only footprints, take lots of pictures… (and send them to us! )11) Please remember that because of the incompatibility with the farm animals there are NO DOGS ALLOWED at Muscoot. See you on Sunday at the Farm!